Called in on Friday afternoon. It was absolutely dead. Lovely little pub with loads of character. The bar staff were friendly enough whilst watching the snooker. Green King beers were well kept. We are very disappointed to have to leave such a negative review but have never been treated in such an appalling way. A party of 10 of us came to celebrate a friend's birthday. We sat at some tables and bought some drinks (around 6) to begin with. The barman hovered around, then asked antagonistically if those were the only drinks we were getting. We were quite surprised as this didn't seem an unreasonable amount and we'd only just arrived. A few moments later the manager appeared and aggressively told us this wasn't a library and that we had to buy more drinks if we wanted to stay. We showed the drinks we had bought and by this time the barmen had become very heated. They were insistent that we had not purchased enough and were taking up too much space, but the pub was by no means crowded. Trying to ask for a proper explanation we were treated very rudely. Upset by this reception we moved outside with barely started drinks and were told to 'piss off'. 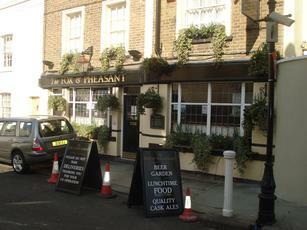 We took a photo of the pub to use as evidence of our treatment, whereupon we were chased away by the second barman. We were an eclectic and unusual looking group, but acting in a thoroughly reasonable, quiet and unthreatening manner, wanting only to peacefully celebrate a birthday. 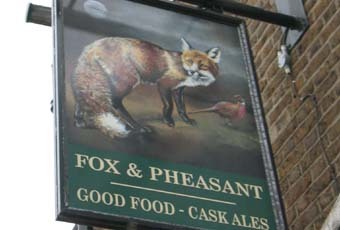 We were treated with inexplicable hostility and thoroughly recommend avoiding this terrible pub at all costs. Interesting little pub down a private road. Beer was from the GK stable but reasonably well kept. Split into a bar and a lounge and from a door in the latter, a man in dressing gown and slippers (presumably the landlord) would emerge to talk to the friendly barmaid. He may well have chatted to punters too if there had been any besides us. Don't know why it was so quiet (we were in on a Sunday and a Wednesday) because it was far better than the rotten but busier pubs at nearby Fulham Broadway. Maybe we just picked the wrong nights. Would certainly drop in again if in the area. Having read the reviews it's clear why it all went a bit quiet when I tried to engage the patron in a bit of banter...fortunately (for me it seems) he managed to take it in the spirit it was meant. I really liked the place anyway: loads of character, I enjoyed the beer and the food. Was sorry that time was not on my side for the visit, could have spent ages there.